Chances are, if you own an AR-15, you have a lot of tactical needs in mind for your rifle. 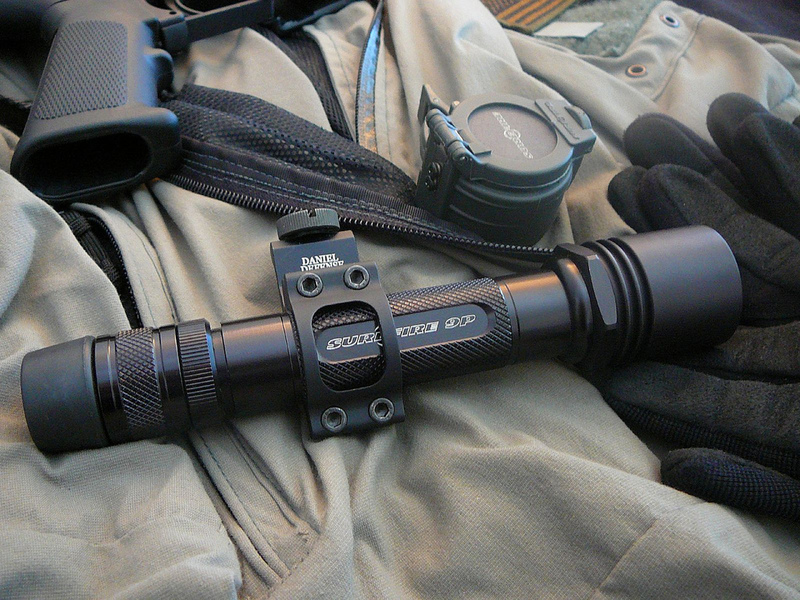 One of the most useful accessories to a tactical weapon is a red or green laser light. An AR-15 laser light can be used for a multitude of uses, including home defense, law enforcement, military purposes, and even a little target practice. We’ve compiled a review of what we think are some of the best AR-15 lasers on the market. We’ll let you know at the end of this review what we think is the best AR-15 laser for the average gunowner. When you’re purchasing a laser for your AR-15, you’ll want to consider a few things such as the weight of the accessory, any additional features you may be looking for, and how budget friendly your top choice is. With an AR-15 in mind, you’ll also want to remember that your laser will need to be very shock proof and will attach securely to the rifle. 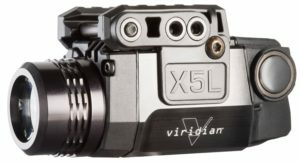 Materials – The Viridian X5L Green AR Laser is made of all black aircraft grade aluminum, and the front and rear covers of the sight are made of Zytel polymer. With the battery installed, this green laser only weighs 3.3 ounces. The high intensity green laser puts out 178 lumens of continuous light, and it offers 224 lumens on the strobe light mode. In daylight, the light reaches up to 100 yards. By night, this green laser can reach up to 2 miles. The battery is included, and the constant laser can run for up to 6 or more hours. There are windage and elevation adjustments on the laser, and it can be used ambidextrously. The rail mount is universal, and it can fit any railed pistol. Performance – If you trust the Viridian brand, this is the best last for AR-15 rifles for quality and strength. The body is very durable, and the green laser is very strong. We love that there is a strobe feature, as this is a huge advantage when it comes to home or self defense. It’s easy to install or switch between weapons. The incredibly long range of the laser is great for anyone who is in the field or literally in a field! The sight is accurate and clear, which is necessary for precision shooting. Used on an AR-15, this laser might need some readjustments from time to time. What we say – The Viridian X5L AR-15 Laser Sight is a fantastic purchase for anyone who can afford it: no matter where you look online, it’s pricey – ouch! That being said, you’re investing in a universal accessory that has a trusted name behind it. When something as simple as a green laser can ensure your life or death, you may want to consider investing in a trustworthy brand. LED LIGHT: 178 Lumens of bright light with horizontal light dispersion to better view threats across a wider area. Use the 224 Lumen strobe mode to disorient attackers. EASY ACTIVATION: Easily activate the world's brightest laser and/or LED light when drawn. No fumbling with buttons in critical situations. Materials – The Fayachi Laser Light is an all black body made of durable materials and weighs a little under one pound. 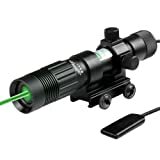 This laser sights emits a crystal clear and bright green laser, which can reach up to 100 meters by day and 1000 meters by night. The laser fits any Picatinny rail mount, and it can be installed on the top of your AR-15 or under the barrel of any pistol that allows it. 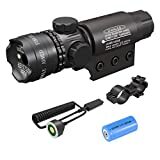 This AR-15 laser sight comes with a rail mount, a set of Allen wrenches, a rechargeable battery, an 8” type mount, and a handy pressure switch. There is also a barrel clamp mount included, which allows the user to attach this laser to the top of a scope. The clamp mount allows you to position the laser anywhere along the scope to provide the proper amount of eye relief. Performance – We love that all of the necessary parts come with the Feyachi laser. How many times have you been burdened by the need for the proper tools or mounts after buying a new accessory for your AR-15? Feyachi has you covered. We also love that there are a variety of ways to mount this product. The pressure switch has an expandable cord, which is great for keeping it in a handy spot while aiming. Our only complaint is that the laser sight gets quite wide after a few yards, which can really screw up your aiming. If you think you’ll use your tactical weapon at a slightly closer range, then this is still a safe choice. 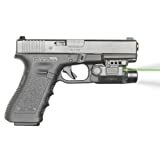 What we say – This is an incredibly cost effective green laser sight. The Feyachi laser only costs a fraction of the option above, so it’s the best laser for your rifle if you’re on a budget. The versatile clips and mounts are a huge plus here, and it allows you to be a little creative with your AR-15 setup. Powerful Green Laser: Built with CLASS IIIa green laser (Max Output ≤ 5mw) which feaures 532 nm wavelength. Highly visible in any environment with improved accuracy which reaches 100 to 30 ft during the day and up to 1000 ft at night. Durable and Adjustable: Made of aerospace grade aluminum with a hard anodized finish that stands up to high impact and the shock created by caliber rifles, which works well in any weather condition. The sight is fully adjustable for windage and elevation, which is ensures precise targeting. Dual Mounting System: Feyachi Tactical Green Sight Laser Dot with a picatinny mount can install on 20mm picatinny or weaver rail. And it also can be installed onto riflescope with supplied 1'' ring adapter. Easy installation according to different rifle types. Materials – The Redfield Counterstrike Laser Sight is an all black accessory that features a green AND a red laser as well as a Scope. The lens system is fully multicoated and protected with a nitrogen filled weather sealing. Redfield began building scopes in 1959 but eventually went out of business. Later on the infamous scope manufacturer Leupold bought the company. Today Redfield scopes come with Leupold quality and lifetime warranty for a very fair price. The lasers offer 11 levels of brightness. It weighs under 12 ounces, and it’s designed as a base mounted piece. It has knobs to adjust the elevation of the laser as well as windage, and they come with turret covers. The optics of this laser are unmagnified, and it’s intended for optimal sighting, providing endless eye relief. The mount of the Redfield Counterstrike laser is built in for fast installation or removal. Performance – We are impressed with some of the additional features on the Redfield Counterstrike Laser, which not many other lasers offer. A red and green combo can be really ideal for anyone who intends to use their laser in different lighting scenarios, and the 11 brightness levels really come in handy for this intent as well. As a bonus it’s also a great way to save battery power! That’s really important here because the battery life won’t last as long as the other laser sights listed here. Although unless you intend to leave your laser on for the whole day (which we can’t imagine why), then this shouldn’t be a huge concern. 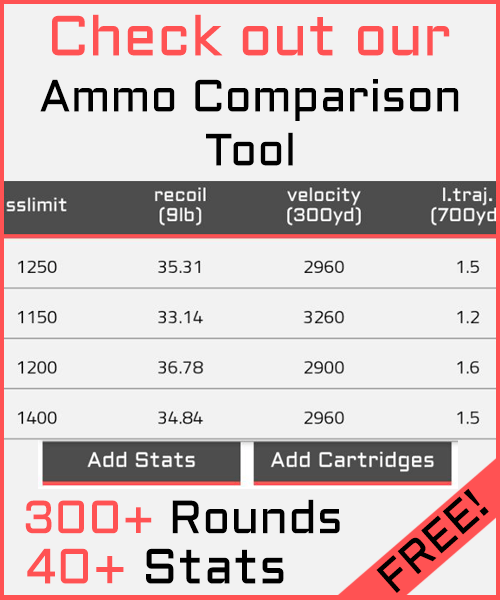 What we say – The Redfield Counterstrike Laser comes with a mid-range price tag, and considering all the great features it offers, you will definitely get your money out of it. The ability to switch between red and green is a huge advantage, allowing you to adapt to different light settings making your AR-15 a far more versatile tool to operate. 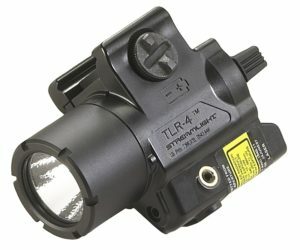 Materials – The Streamlight TLR-4 is made of an all black polymer body with an LED tactical light. The entire laser weighs under 3 ounces, making it the lightest and most compact product within this review. The on and off switch is ambidextrous, and the laser offers three light modes: laser only, laser and light combo, or light only. Mounting the laser is simple, requiring only to be snapped in place and tightened with a knob. The battery lasts for approximately one and a half hours of continuous use, and the battery is included with the laser. Performance – We love how compact and light the Streamlight TLR-4 Laser Lights are. They’ll barely take up any space on your AR-15, and they’re light enough to make a great addition to any handguns that will hold it as well. The simple installation is really ideal for anyone looking to use their green laser sight on multiple weapons. Our only complaint is that the lightweight material does make it easier for it to be damaged. We suggest avoiding leaning the laser sight up against any surface or other accessories or weapons. What we say – The Streamlight TLR-4 Laser Sight is another cost friendly purchase, but we would still consider it mid-range. 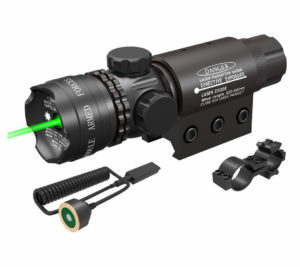 This is the best option for anyone who strongly wishes to avoid adding any additional weight to their rifle and requires the standard needs of a green laser sight. 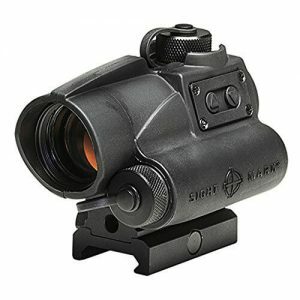 Materials – The AT3 LEOS Red Dot Sight (with an integrated red or green laser) is a 2 MOA red dot and adjustable laser sight. The sight itself is built out a very durable 6061 aluminum housing. This sight is also fully waterproof, and the bright red or green integrated laser is very bright and enables you to line up the sights instantly. The interior of the sight is fogproof and filled up with nitrogen in order to make it so. It accepts a single CR123 battery, and is also very lightweight at just eight ounces. But despite its inherent lightweight, the AT3 LEOS is also highly durable thanks to its strong aluminum housing design, and has an overall impact resistance rating of up to 800 Gs. To put that in plainer terms, you can throw this sight hard against cement or concrete, and it should remain unscathed other than maybe for a few scratches. Performance – One of the most important qualities to look for in any red dot sight is how long the battery life is, and in the case of the AT3 LEOS, the battery will run for 50,000 continuous hours even when the sight is kept turned on. There are also six separate brightness settings for the red dot, but be warned that the higher the brightness settings will reduce the battery life (the 50,000 hour continuous battery life is for the lowest brightness settings). Some users of the AT3 LEOS do report that the sight can be rather difficult to adjust. For example, even though the adjustment knobs on the sight do work, it can take multiple clicks before you begin to notice a difference while shooting on the range. As added benefits, the AT3 LEOS comes installed with flip up lens caps, tool free windage and elevation adjustments, and a riser mount housing. It also comes with a lifetime warranty from the manufacturer. What We Say – As a whole, the AT3 LEOS sight is highly durable. Both the 2 MOA red dot and the green or red laser are very bright and easy to line up. 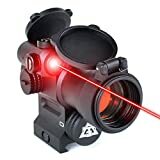 Peer through the red dot, center the dot over your target, and then line up the dot with the laser, and you will be able to make several easy shots right on target. Our top pick for the best laser for AR-15 rifles is the Redfield Counterstrike Laser Light Combo. It’s not the cheapest option, but it’s certainly not the most expensive. We love it so much because it covers nearly anybody’s basic needs. Most importantly, the designers have kept lighting in mind by equipping it with two colors and additional brightness levels. 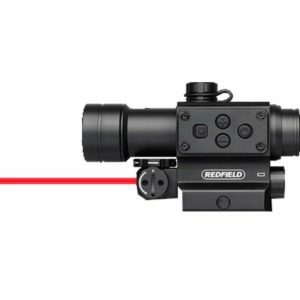 If you’re looking for a quality red or green laser sight that covers standard tactical needs, the Redfield Counterstrike would be an excellent purchase for you. If all you came for was a standard AR-15 laser then without a doubt the green laser made by Viridian is the best choice as long as it fits in the budget you had in mind. However, considering the price even the remaining two options on this are a no-brainer. The reason we can recommend all of them is that there is a ton of options to choose from and trust us here, we had to skim through a lot of cheap china stuff to find these 5 gems.